Localization of pain is determined by whether the pain is superficial somatic, visceral, or deep somatic. Nociceptive pain is caused by stimulation of peripheral nerve fibers that respond only to stimuli approaching or exceeding harmful intensity ( nociceptors ). Nociceptive pain may be classified according to the mode of noxious stimulation, the most common categories being thermal (heat or cold), mechanical (crushing, tearing, etc. ), and chemical (iodine in a cut, chili powder in the eyes). Superficial pain is initiated by activation of nociceptors in the skin or other superficial tissue, and is sharp, well-defined, and clearly located. Visceral pain is diffuse and difficult to locate; deep somatic pain is dull aching and difficult to locate; and superficial somatic pain is sharp, well-defined, and easily located. Deep somatic pain is initiated by stimulation of nociceptors in ligaments, tendons, bones, blood vessels, fasciae and muscles, and is dull, aching, poorly localized pain. Referred pain is characterized by pain felt in a location away from the site of the painful stimulus. visceral pain: Visceral pain is diffuse, difficult to locate, and often referred to a distant, usually superficial, structure. It may be accompanied by nausea and vomiting and may be described as sickening, deep, squeezing, and dull. deep somatic pain: Pain initiated by stimulation of nociceptors in ligaments, tendons, bones, blood vessels, fasciae and muscles; it is dull, aching, poorly localized pain. Examples include sprains and broken bones. superficial somatic pain: Pain initiated by activation of nociceptors in the skin or other superficial tissue; it is sharp, well-defined, and clearly located. Examples of injuries that produce superficial somatic pain include minor wounds and minor (first degree) burns. 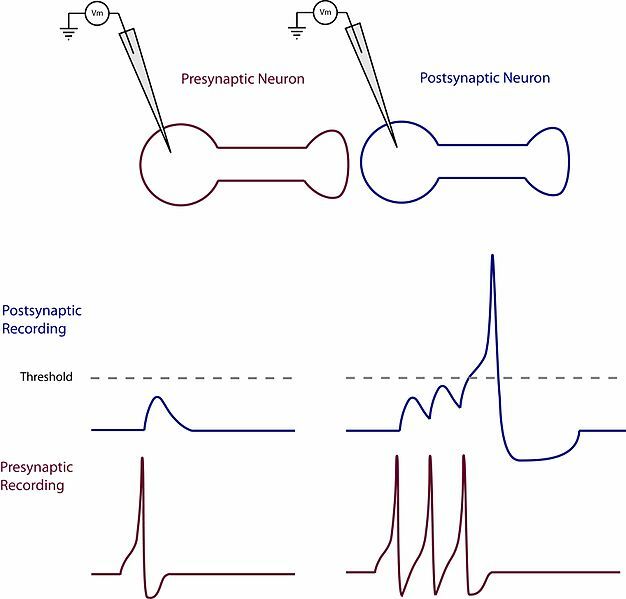 Nociceptive pain is caused by stimulation of peripheral nerve fibers that respond only to stimuli approaching or exceeding harmful intensity (nociceptors), and may be classified according to the mode of noxious stimulation. The most common categories are thermal (heat or cold), mechanical (crushing, tearing, etc. ), and chemical (iodine in a cut, chili powder in the eyes). Nociceptive pain may also be divided into visceral, deep somatic, and superficial somatic pain. Visceral structures are highly sensitive to stretch, ischemia, and inflammation, but relatively insensitive to other stimuli that normally evoke pain in other structures, such as burning and cutting. Visceral pain is diffuse, difficult to locate, and often referred to a distant, usually superficial, structure. It may be accompanied by nausea and vomiting and may be described as sickening, deep, squeezing, and dull. Deep somatic pain is initiated by the stimulation of nociceptors in ligaments, tendons, bones, blood vessels, fasciae, and muscles, and is a dull, aching, poorly localized pain. Examples include sprains and broken bones. Superficial pain is initiated by activation of nociceptors in the skin or other superficial tissue, and is sharp, well-defined, and clearly located. Examples of injuries that produce superficial somatic pain include minor wounds and minor (first degree) burns. Referred pain (also reflective pain) is pain perceived at a location other than the site of the painful stimulus. An example is the case of ischemia brought on by a myocardial infarction ( heart attack), where pain is often felt in the neck, shoulders, and back rather than in the chest, the site of the injury. The International Association for the Study of Pain has not officially defined referred pain as of 2001; hence, several authors have defined the term differently. Radiation is different from referred pain. The pain related to a myocardial infarction could either be referred pain or pain radiating from the chest. Classically, the pain associated with a myocardial infarction is located in the middle or left side of the chest, where the heart is actually located. The pain can radiate to the left side of the jaw and into the left arm. Referred pain occurs when the pain is located away from or adjacent to the organ involved. An example would be when a person has pain only in their jaw or left arm, but not in the chest. The size of referred pain is related to the intensity and duration of ongoing/evoked pain. Also, temporal summation is a potent mechanism for the generation of referred muscle pain. Central hyperexcitability is also important for the extent of referred pain. Temporal summation: Temporal summation, shown in the diagram, is the transmitting of signals with increased frequency of impulse, thus increasing the strength of signals in each fiber. Temporal summation is a potent mechanism for the generation of referred muscle pain. 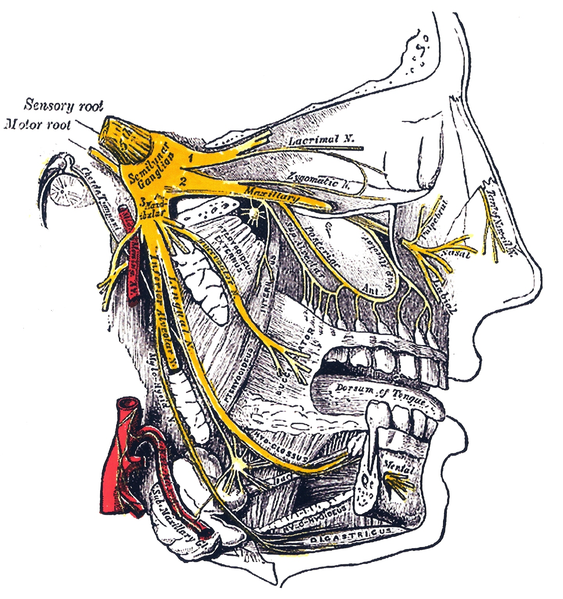 Brain freeze: In an ice cream headache, known colloquially as brain freeze and medically as a cold-stimulus headache, the trigeminal nerve, shown in yellow, conducts signals from dilating blood vessels in the palate to the brain that interpret the pain as coming from the forehead.